Are you throwing money out the window? You may be paying more in utility bills than you should if the solar panels on your roof need cleaning. LeafVac’s professional solar panel cleaning services can lower your electricity bills and prolong the life of your precious investment in green energy. Order solar panel cleaning today. If you don’t clean your solar panels about once a year, they can lose as much as 50% of their efficiency. This means you have to source more electricity from the grid and pay higher utility bills. It’s money down the drain, but there’s worse. Dirt, grime, moisture, bird droppings, and air pollution can corrode the surface of the panels and render them useless prematurely. If you are smart, you’d like to keep the solar panels in a spotlessly clean condition. 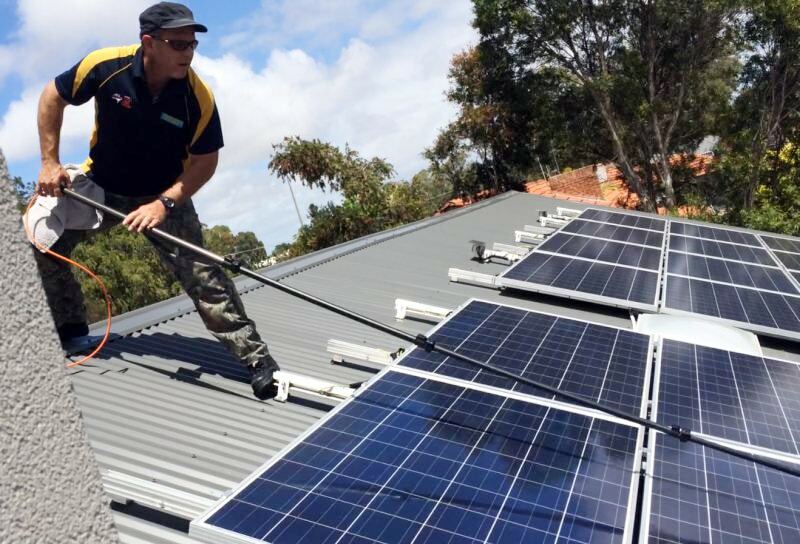 With LeafVac’s professional and affordable services just a phone call away, there’s no reason for you to ignore or delay solar panel cleaning in Melbourne. You should order professional solar panel cleaning at least once a year. However, if you are living near a source of pollution, such as a highway or an industrial zone, cleaning the solar panel more often can save you more money. The power output of the solar panels installed at Google’s Mountain View office increased by 50% when they were cleaned after 15 months. On the average, solar panels that are cleaned once and twice a year produce 3.5% and 5.1% more electricity. 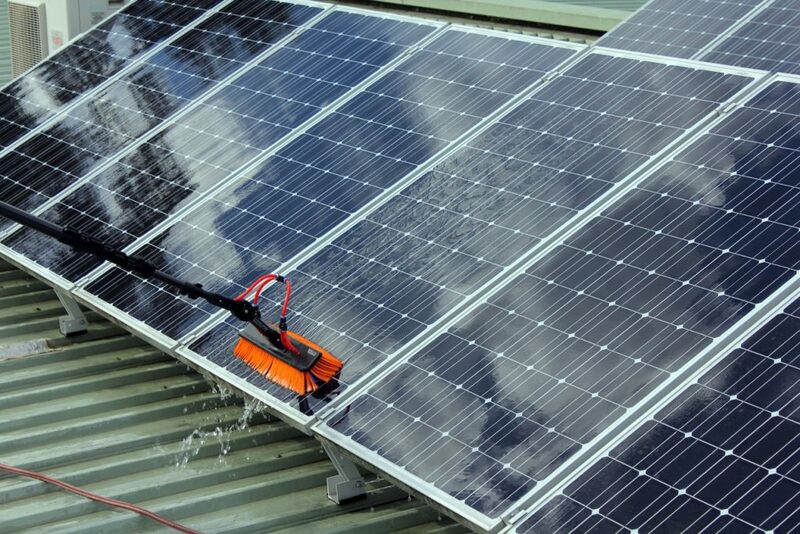 LeafVac’s solar panel cleaning service saves you a significant amount of money in the long run. Contaminated water and harsh detergents can cause irreversible damage to the panels. You should make sure that the solar panel cleaning crews you hire know what they’re doing. Not every roof cleaning company is competent in cleaning solar panels. LeafVac uses de-ionized and distilled water and special solar panel cleaning materials to make your panels shine like new. We use low pressure washers, mild and eco-friendly detergents, and special solar panel cleaning wipers and brushes. If you measure the watts your solar panels produce before and after the cleaning, you’ll get a pleasant surprise! You can probably clean the solar panels yourself if you have them installed in your backyard. But we won’t advise getting up on the roof to clean roof-mounted panels yourself. Working on heights is dangerous. As the property owner, it’s your responsibility to ensure that anyone working on the roof takes the appropriate safety measures. At LeafVac, we take no chances with safety. Dirt, grime and other sediments pull down the power output of your solar panels. LeafVac’s 5 –step cleaning process can restore the panels to their peak efficiency. FREE QUOTE: Contact us now for a free quote. We’ll ask you for a few details like your address, the height of the roof, and the size of the solar panels before we provide an estimate. ARRIVAL AT SITE: When you approve our proposal, our solar panel cleaning experts will report to you at the appointed time. They’ll bring along pressure washers filled with distilled and de-ionized water, roof access and PPE equipment, and everything else needed for the job. ROOF ACCESS: Our safety-trained crews will climb up on the roof using ladders or a platform lift where needed. They’ll be wearing the PPE gear and safety harnesses at all times when working on the roof. PRE-CLEANING INSPECTION: We’ll inspect the panels, ask you to record the power output, and point out any other discrepancies like a dirty roof or clogged gutters, just in case you want to get everything cleaned in one go. SOLAR PANEL WASHING: Our experienced workers wash the impurities and wipe away the residue from the panels using soft wipers and brushes, until the panels are spotlessly clean.